Fast and accurate service. Bravo. I ordered shirt & pants in larger sizes than I normally wear and they fit but both are tight, especially in the waist and shoulders. The good news is they provide incentive for me to lose some weight. Jackets and trousers arrived very quickly, I ordered the jackets a bit larger so fit ok, trousers are a bit baggy but will take in easy enough so well pleased. good example of b/dress jacket and khaki trousers. Both well made and fit well. Speedy dispatch, as always. Thank-you. quick despatch, and item exactly as wanted. many thanks for a stirling service, and please count on our return. Great price for great gear. Jackets run a little small so I ordered two sizes up for jacket. Pants fit as ordered. Great set. Very good, can't wait for summer now! Trousers fit good though on the extreme baggy side. Shirt was like discribed, made for small shoulders, shipped was great. Lovely shirt, but find the sizing on the optimistic size. Asked on got a size 44 chest, but quite tight and never had that problem with cloths before or after, especially on american sized cloths! Great service and items as always! Fantastic set at fantastic value and high speed delivery as always. Many thanks! Ordered set on Mondey...arrived on Friday, wore to reenactment on Saturday...can't get any better than that! Thanks much! Shirt fit is absolutely true to size...not much room for arm lift..I suggest ordering up a size or two for extra room if you don't like your tops fitted. Pant's are fitted true to size. Thanks much Jerry...you know I'll be back mate! I agree with Pace's comment on the fit of the BD. There is something funky with the sleeves and where they fit at the shoulders near the armpit. It is tight. I think a look at the pattern is in order. I will still keep it as the rest fits nicely. I will not wash in hot water. I got the largest pants and they are too small. I was taking a chance on that one. My advice would be to order a size larger than you are to allow for shrinkage an manufacturing unless Jerry tells you otherwise in his descriptions. Great KD starter package, after a few sweaty summer airsoft skirmishes and long soaks in the bucket they look battleworn and feel just right to wear. I bought the trousers an inch or two up and they have shrunk down nicely at the waist from a couple hot soaks, but are still nice and baggy like you want them. The jacket I also bought slightly oversize, leaving it nice and breezy for a hot day, or accommodating when you want to wear a sweater underneath. Good quality but fit of Blouse is strange, wear a 44, took a 46 and sleeves and shoulders rather tight, also waist band is placed too low, blouse cut too long. very nice unifiorm,fit's fine !fast shipment! great buy!! love doing business with WPG!! Great looking uniform. And the fast shipment made this a great buy.Highly recommend. The aertex BD blouse is a very odd fit for me. I am normally a 44L so ordered a 46 (no long sizes available) to have a little bit of room at the top. But it was too small across the shoulders in the front yet not the back. Just a wierd cut. It seemed that it needs more fabric width about 4" down from the neck on the front and from the sleeve seam on the left to the sleeve seam on the right. So I returned it for a 48 thinking it would be better but is was pretty much the same fit. I will try a 50 giving it one last try. As for the midwar KD trousers, I originally ordered a 40 as that is my size but they were really a size too small. I exchanged them for a 42 and the 42 fits fine. The top of the trousers goes to about 2 inches above the navel so they are proper for wear with a BD blouse. The two front straps have quality buckles with prongs that insert through real round buttonholes unlike the similarly constructed KD shorts that WPG sells that merely have friction held buckles. Quality of construction is high although I had to reattach a few of the buttons that were poorly sewn. I wish that they came with extra buttons as I eventually will loose one as the rough edge of the holes in the buttons cuts the thread easily. Jerry should sell a KD repair housewife kit that includes proper sewing thread and replacement buttons. It is hard to match the tan khaki at the sewing store! Jerry has two shades of KD and these are made of the tanner shade of my bushjacket and early war KD trousers rather than the orangey shade of the KD SD tunic and KD shorts. Very good kit. Aertex is spot on and very comfortable to wear. Trouser sizes are a bit wonky, but they still fit. Seems like they are one size down from what the label says, but no matter. Shipping was expensive, but fast. Great looking uniform. Love the package deal. And the fast shipment made this a great buy..
Nice quality and fits perfect. Speedy delivery. I bought this item for my husband,his comment:I saw this package deal,thought to myself:cheap,what''s the catch.when it arrived,I realised what the catch was.It was catch of the year,I could not believe the quality,cut,and attention to detail for the price,even taking into account the shipping to England,it was still a lot cheaper than UK goods.If anyone out there is looking to get in to reenactment and wants a full quality uniform at an unbelievable price,get one of these,you will be well pleased. A brilliant uniform, high standard, great finition. A must for any MTO reenactor. WPG has proven once more that its products are top notch! Thanx Jerry! I got my set late last month and they are perfect in every way. As standard with What price glory super fast shipping! I recently received my UK Aertex tropical Battledress (Package). As always it was fantastic!!!! much) in this a.m.'s post! Wow! regarding your establishment and wares. Thank you once again for a job very well done! 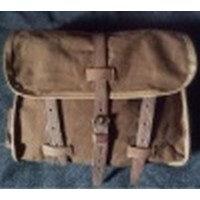 Very nice reproduction, WPG include a correct pattern waist buckle to change over from the ''Farb'' one the manufacturer supplied. Better quality Airtex than some other vendors are offering.